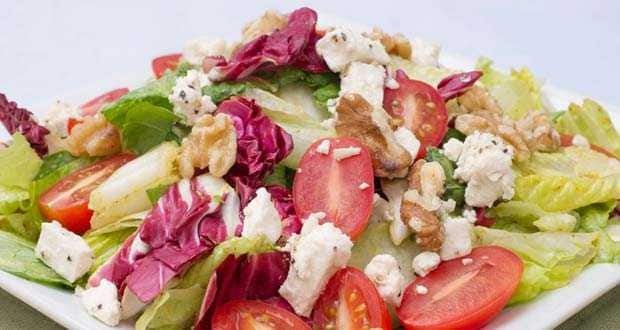 About Leafy Salad with Walnuts Recipe | Salad Recipe: A simple and refreshing salad of leafy greens, tomatoes and walnuts. Leave the ham out for a vegetarian version. 1.Mix the leafy vegetables and the cherry tomatoes with the ground walnuts in a glass bowl. 2.Add the walnut oil and the sherry vinegar to the salad and mix well. 3.Serve with the parma ham.